This year we will celebrate the academic and athletic achievements of eleven outstanding individuals. The Class of 2009 honors some of Alaska’s finest prep athletes, coaches, officials, and a tireless contributor to high school and youth sports activities. Also, for the first time in the history of the Alaska High School Hall of Fame, two outstanding individuals who have contributed to student government and music will be honored. 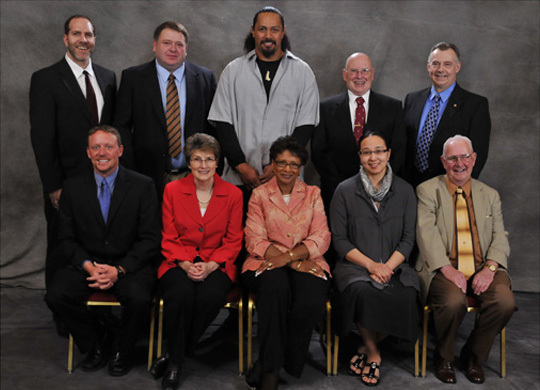 All of these inductees demonstrate the synergy and effectiveness of interscholastic participation, and demonstrate the life long values of sportsmanship, integrity, teamwork, self discipline, loyalty and cooperation that are instilled through ASAA activities. We appreciate the continuing sponsorship of Alaska Airlines, one of the country’s most respected air carriers. We also thank the ASAA major sponsors, First National Bank Alaska, Spenard Builders Supply, AT&T, Alaska Commercial Company and KTUU for their many years of ongoing support. We take great pride in inducting the members of the Class of 2009. We invite all inductees, families, friends, supporters and constituents to share in the enduring spirit of this occasion. Click on an inductees name to view more information.